At our church, we include a children’s talk in almost every Sunday service. Most of the time the talk is from the same Bible passage that the sermon will be on. Recently, we did a seven week series on Song of Songs. I decided not to try kids’ talks on this beautiful and sensual poem! Instead, I did my first ever kids’ talk series: seven weeks just for them, on a theme, with consistent ‘props’. It was my lego kids’ talk series. Here’s a breakdown. Talk 1 used Acts 7:50/Isaiah 66:2. The initial point is that God made everything. 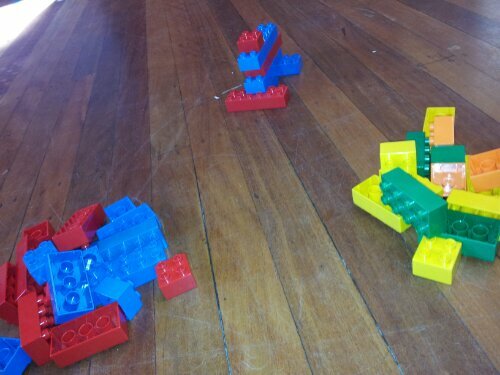 It’s a little like when we make something, such as the lego ‘creature’ (below). From this point, I noted two linked ideas. Firstly, that God is in control of everything. Secondly, that God loves world – he made what he wants. 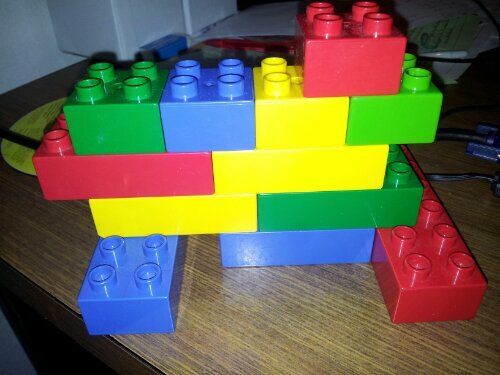 With my and my lego beast, I was in control of choosing its colours and shapes. And I assembled the pieces just the way I like them. Talk 2 used Romans 1:22-23. The creature pictured above made a second appearance. We then recapped the points from the previous Sunday (and the kids’ surprised me by remembering in detail). This week’s point was an important reality check. Because God made all we should thank him & love him. But instead we choose to love & thank things he made. I described sin as loving something God made more than we love God himself. Talk 3 used Romans 5:12. The series so far had reached the reality of sin. Now what happens? We learn that sin has definite consequence, the punishment of death. To show this, In this, I broke into pieces the lego creation. I wanted the content to leave the impression here, not some scary presentation style. So I went gently in words, and also in how I broke the lego apart. No theatrical violence, this is serious and sad! Talk 5 used 1 Corinthians 15:20. Time for a new item. As well as the block creature pictured above, I added a second one as shown below. They were identical in shape, but the second had well-organised colour. It was the same, but more attractive. This lego work represented the risen Lord Jesus. I mentioned: Jesus is alive; Jesus can never die again; Jesus has everything just right. My point was that what Jesus is, all his followers will become (even if we are a bit untidy and messed up now). Jesus’ resurrection guarantees resurrection life for all who trust him. Talk 6 used Hebrews 1:3. Jesus sat down at Father’s side. Therefore we cannot see him, but his still active. Jesus is ruling the universe by his word! 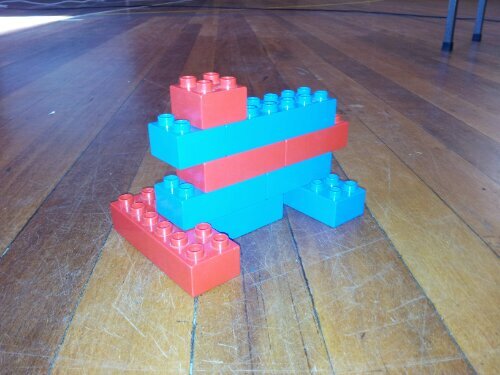 For this one, the two lego shapes – representing us and Jesus – started in public view. While all were watching, I ‘hid’ the Jesus block in a bag and said, ‘There is only one block here.’ The kids automatically yelled out that of course there were two – just that we can’t see one of them. From this, I underlined that the risen Jesus is real, though now we can’t see him. Talk 7 used Acts 10:42. Jesus, whom we cannot now see, will appear again. When he does, all we know that he is God’s appointed judge. He will divide people on the basis of those who trust him or reject him. So trust him today! The photo below is from the end of this talk. I started with just the Jesus figure, and said he will appear again. Then I poured all my loose lego pieces in one confused pile. Sorting the pieces into colours (like Jesus, and unlike Jesus) gave the kids the hint as to what Jesus will do: divide people. What’s the difference? Trust in Jesus, or rejection of Jesus. Since that is what will happen, let’s all trust him now. This entry was posted in Bible, Ministry and tagged 1 Corinthians 15:20, 2 Corinthians 5:17, Acts 10:42, Acts 7:50, Hebrews 1:3, Isaiah 66:1, Kids' talk, Romans 1:22-23, Romans 5:12 on 17 June, 2013 by Chris.